Jonathan Sexton's famous boots were sold off at €15,500 for the two. There was another 10 grand paid up front by way of bank draft by Betty Boots. Betty's perfect 10 brought the total to €25,500 for the world's most famous (and smelliest) pieces of rugby memorabilia. The auction at Sheppard's of Durrow wasn't at all what I expected it to be. I had this idea of a Lovejoy winking and nodding in his bids, at the back of a packed auction hall. It's mostly all done online now but there was drama. Betty Boots isn't the under-bidder's real name. Betty wishes to remain anonymous. She is one of the good people we seldom get to hear about. Betty is a mom and a Dublin GAA fan who gave €10,000 to a small girl from near Mallow in Cork. She read here of the Browne family's battle to get their Anna to St Louis in the United States for a big operation. Anna has cerebral palsy and the operation was a huge success. The bravest and bestest of small girls can run and walk to school now, but there are many more days of fight-back ahead. There is little if any back-up provided in this country by way of aftercare. Anna is just back from Wales and a week of intense specialist physiotherapy. Her big sister Emma did every single exercise with Anna in St Louis and in Wales. Emma is the best sister ever. A Cork man living abroad covered the cost of a full year's physio for Anna. He too wished to remain anonymous. The secret millionaire made a bit of money and he gets far more pleasure out of spending it than making it. I got some buzz out of the auction in Sheppard's. There were six people taking online and telephone bids, sitting at a table in front of auctioneer Michael Sheppard. Every time a bid came in, one of the bid-takers stood up and Michael called it out. It was all on screen and hundreds of people were watching live. The bidding opened at €5 and moved on up as the bargain hunters gradually dropped out. The bidding came to €1,000 and the next bid was €1,002. That was a worry but I knew we already had €10,000 in the bag from Betty. The auctioneers just wanted to acknowledge all the other bidders. The real action started when Betty's €10k was out-bid. Betty was there. Only I knew who she was. She called in to John B's during the summer with her husband. He's a friend. Betty came in to some money - not a massive amount, mind, and she wanted to give something back. Betty's money was spent, with her permission, on Anna's operation and she followed up with new bids of her own. The bids from Ireland, Australia and the US were coming in fast and furious. Betty kept pace for a while and then she stopped. I will tell you why later on. The final bid was €15,500. The boots were sold to an international businessman who is Irish. I have no idea who he is. 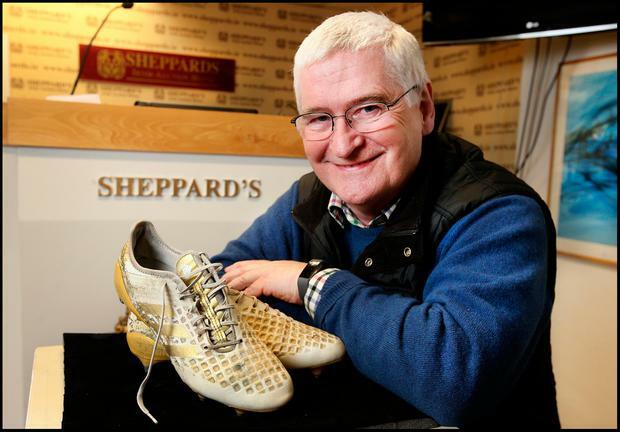 Philip Sheppard, the MD of Sheppard's, told us the buyer planned to send the boots around to schools to encourage the kids to take up sport. The boots will stay in Ireland. After the auction I met with an older lady outside Bowe's classy coffee shop, right next door to Sheppard's. She opened up her purse. I couldn't help but look in. It was one of those small, old-fashioned purses from the days when people hadn't much. All I could see was a tenner, a five and some loose change. She took out the fiver but then she put it back in and gave me the tenner. "That's for the little girl, for a Christmas box." What's your name, ma'am?" I asked. "Anonymous," she replied. Durrow has reinvented itself from what seemed like the endgame when the town was by-passed by the Dublin-Cork motorway. This is an old place with real people. Sheppard's employs 18 people and there are several spin-offs such as removers, upholsterers and furniture restorers. The auction was run very efficiently, with more than 1,200 lots sold off to bidders from all over the world. I would urge city businesses to move to a place like Durrow. The houses are reasonably priced with good schools and even a 16km commute takes only 15 minutes. We ate the best feed of beef ever in the Castle Arms and the lovely chips in the Copper Kettle takeaway are made from the finest of real spuds. I met with Betty Boots after the auction and she explained why she stopped bidding. "I really wanted the boots but then I thought to myself, if I bid any more the family will lose out." If Betty won, Anna would have benefited by another five thousand or so but if the Secret Millionaire won well then she would be up another €15,500. And so Betty Boots gave up on her dream. When Jonathan heard the story he promised to send something nice on to Betty for Christmas. There is someone up there looking after Anna. I spoke to Jonathan a few weeks ago and asked him if we would beat the All Blacks. "Yes," was his reply. That was good enough for me. So we took the boots out of an earlier but bigger auction. The bet paid off. On Sunday last, Jonathan was voted World Rugby Player of the Year. He is now officially the best player in the world. It was the win over the All Blacks that swung it and increased the value of the boots that kicked the 48 metre 'Le Drop' to beat France in the last play in the Six Nations earlier this year. Yes, the boots were smelly. He wore the boots for every second of the Grand Slam, the European Champions Cup and the Pro14. Jonno never lost in those boots. Evelyn Browne, Anna's mom, was wondering where the terrible smell was coming from when she went in to her sons' bedroom. She found Jonno's boots under the bed. Sean and James had "borrowed" the boots. Evelyn fumigated the boots with every kind of anti-stink spray. I banned her from any cleaning of the boots after that. The smell was the smell of victory. And so it was that two young hurlers playing for the Clyda Rovers under-16s and -17s came to be wearing a pair of football boots worth €25,500.